July 15, 2012 - Boeing announced an order by United Continental Holdings, Inc. and its wholly owned subsidiary, United Air Lines, Inc., for 150 737 airplanes, including 100 of the new 737 MAX 9. United, the world's largest airline by traffic, is the latest carrier to choose the newest member of the 737 family, which today eclipsed 10,000 orders overall. The deal, worth $14.7 billion at list prices, also includes 50 Next Generation 737-900ERs (Extended-Range). The Boeing 737 is a short- to medium-range twin-engine narrow-body jet airliner. Originally developed as a shorter, lower-cost twin-engine airliner derived from Boeing's 707 and 727, the 737 has developed into a family of nine passenger models with a capacity of 85 to 215 passengers. The 737 is Boeing's only narrow body airliner in production, with the 600, 700, 800, and 900ER variants currently being built. A re-engined and redesigned version, the 737 MAX, is set to debut in 2017. "This order is a major step in building the world's leading airline, and we look forward to offering our customers the modern features and reliability of new Boeing airplanes, while also making our fleet more fuel efficient and environmentally friendly," said Jeff Smisek, United's President and CEO. "New aircraft deliveries support our flexible fleet plan, permitting us to tailor future capacity up or down, based on changes in demand or other market conditions." United is the North American launch customer for the 737 MAX 9. The order continues the momentum for the 737 MAX, which now has more than 1,200 orders and commitments from 18 customers. Counting all variants, the 737 program now stands at 10,039 orders, further cementing the 737 as the undisputed best-selling jetliner in the world. "United and Boeing share a rich history together and we are delighted United has chosen the 737 for its future fleet, renewing our partnership for decades to come," said Ray Conner, president and CEO of Boeing Commercial Airplanes. "We believe the 737 provides unsurpassed quality and value in the market and will provide efficiencies and other benefits to United's operations." The Next-Generation 737 is the most fuel-efficient and reliable single-aisle airplane today with an eight percent per-seat operating cost advantage over the nearest competitor. The 737 MAX builds on these strengths with big advances in fuel-efficiency and environmental performance. Equipped with new LEAP-1B engines from CFM International and improvements such as the Advanced Technology Winglet, the MAX reduces fuel burn and CO2 emissions by 13 percent while maintaining the eight percent operating cost advantage over future competition. These continuous improvements have powered the program to the impressive order milestone. "To witness the first commercial airplane to surpass 10,000 orders is monumental," said Beverly Wyse, vice president and general manager of the 737 program. "The 737 has continuously evolved and provides improved performance, reliability and exceptional value for our customers." The 737-900ER and 737 MAX 9 ordered by United can seat up to 180 passengers and feature the new Boeing Sky Interior. The sleek interior boasts modern lines, a spacious cabin with more headroom and LED lighting that offers vibrant color options. United Airlines and United Express operate an average of 5,605 flights a day to 375 airports on six continents. 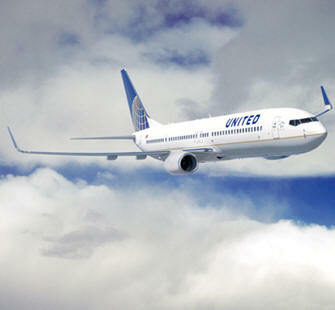 In 2011, United flew more than two million flights that carried 142 million passengers, more than any other airline.